Today is the first public day at the Tokyo Game Show. Meaning? Throngs of people have descended and are lining up to play games. There is one title in particular people want to play, and that is Monster Hunter: World. But they probably won’t be able to! At least, not today. 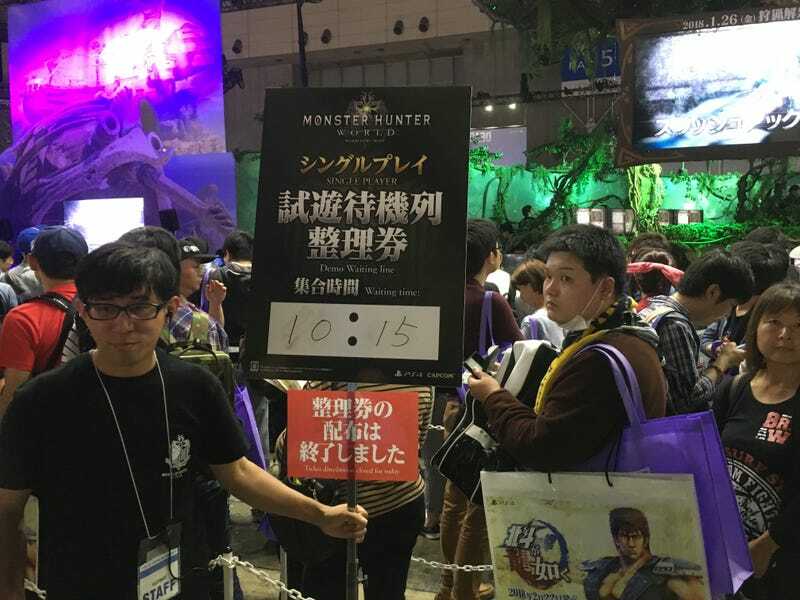 The show opened at 10:00am, but Capcom soon closed the line. There are no more demo slots available today. The sign in the top pic says the line closed at 10:15am, but apparently, there was already enough early admission people before the doors opened, that the line was closed the moment the general public was allowed in. Sony also has a huge Monster Hunter: World display at its booth, which was swarmed with folks hoping to check out the game. But soon after the doors opened, the line for Monster Hunter: World was closed for the day, because all the demo time slots had been given out. Tomorrow, the Tokyo Game Show is once again open to the public. If you plan on playing Monster Hunter: World, my advance would be this: Get in line right now.